Imagine if we, as a society accepted normal infant and toddler sleep. I mean really accepted it, in all its glory. Every part of society, from every generation, every family, every profession, every community, every culture, every religion. What if we knew and accepted it as expected and respected elements of a child’s development? What if everybody knew well before having their own children that their child would need night time parenting for the first few years of life? If everybody knew that waking frequently to nurse was the biologically normal way for an infant/ toddler human to sleep? If everybody knew that we are in fact ‘carry mammals’ and that our young require near constant contact with a caregiver for the first few months to continue their growth and development outside of the womb? If everybody knew that a baby’s and toddler’s sleep can fluctuate a lot over the first couple of years as they grow and develop at a phenomenal rate? If everybody recognised that a baby’s and toddler’s need for comfort, closeness and nurturing at night is just as valid and important as their need for these things during the day? What if nobody doubted the value of night time parenting and wouldn’t even for a moment consider that they could trade it off so they could be a ‘better’ parent by day? We, as a society, would come at infant and toddler sleep from a whole other place than we do right now. There’d be no sleep training and therefore no sleep training industry. There would be less focus on the baby and their behaviour and more focus on the dyad as a dynamic pair and nurturing the nurturer. There would be focus on all levels from family right through to the political sphere on the kinds of support families need to navigate this time in their lives. Antenatal classes and Mums and Bubs groups would be all about helping mothers to build their support network and discovering options that will allow them to meet their baby’s needs while also meeting their own. For mothers who are struggling with intense high needs babies, the support would recognise the extra level of challenge these mother face as they run the Ultra Marathon of her life and help put the supports in place that mother needs and deserves. Mothers with mental health concerns would be nurtured and treated in ways that respect her child’s legitimate needs day and night. Families making decisions about paid employment would do so with the full knowledge that their baby will still require night time parenting. Wouldn’t the world look so different to the way it does right now.? 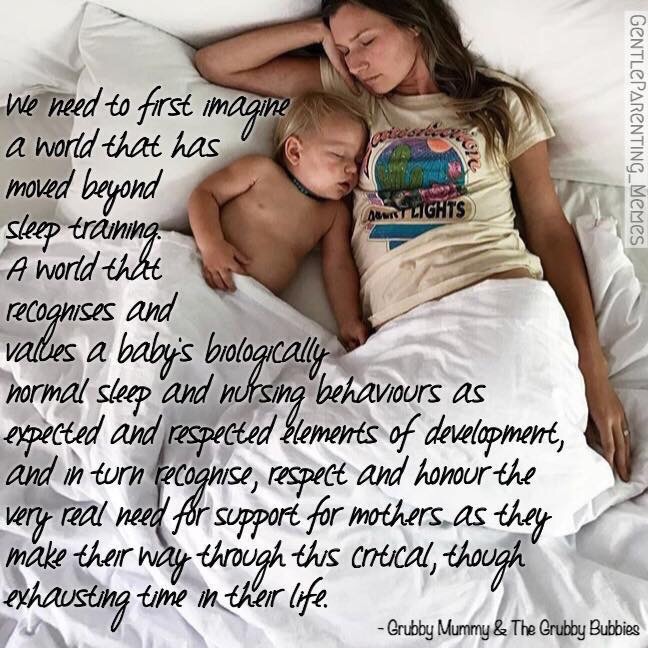 The stress, strain, struggle and sacrifices made all because so few people know and recognise what has always been and always will be the way our tiniest most vulnerable humans find sleep normally. I was told that new and expecting mothers don’t want to know that babies continue waking for a couple of years. I was told I was scaring them unnecessarily and that it was the equivalent of telling horror birth stories to a pregnant mama as she prepared to birth. A birthing mother doesn’t need to hear every horrific tale of every horrific thing that may or may not happen to her. That does nothing to help her towards her own journey. But it equally does not help to tell her that it will be easy, straight forward and you practically just sneeze and the baby falls out without pain/ discomfort. A pregnant or new mother does not need to hear every detail of every form of sleep torture she may or may not face in the years ahead with her child. But she equally doesn’t need to sprint to some arbitrary finish line that someone has told her and think that her child’s night-time needs will magically cease and her sleep will return to that of pre-baby. Let’s be real. Let’s be honest and let’s give new parents the very best chance to set themselves up with realistic expectations for the early time in their child’s life where they will be needed just as much at night as they are by day. I know this may seem like a pipe dream right now, but all it takes is for voices to rise. Mothers and babies of the future deserve better than what is offered up in mainstream society today. When we know better, we can do better and so, for all of those in the know, it’s our turn to share our voice, speak our knowledge and share with all we can the truths of normal infant and toddler sleep. Thank you for this. I’m one of those women who had unrealistic expectations of what sleep would look like and it was a rude awakening when neither of my babies slept anywhere but on me. I felt like I was doing it wrong and needed this kind of encouragement. That it is temporary. That it is natural. That it is important. Thank you, this was my experience. My babies woke up every 2 hours to feed, the first one kept this up for a long time. I was so lucky as my husband could support us at that time, and I was able to study or work part time, and go with the flow of night time care. Recognising this as a good (not stupid) way of parenting – thank you, gives some validation in retrospect. Yet, for a mom who has no choice but working, not possible. May we one day be a society where babies’ needs take any kind of social priority. Amen. This is a fantastic read about infant/toddler sleep. We have three children and with our oldest, I was CONVINCED something was wrong because she would wake 2-3 times for the first year (more obviously in the earlier months) and still wakes at 5 years old. With our second and third kids, I have accepted that this is normal and expected and don’t automatically jump to something being wrong because “kids should sleep through the night at a certain age.” When we know better, we can do better…such #wisewords GrubbyMummy! Good thoughts! Going further, looking at our economic system and the way we have agreed to work in society, this would mean a huge restructuring. The stress of nighttime waking really only becomes a problem when we have work and go to appointments by day and can’t just nap when our baby/toddler does. Here in Germany, we have a system set up to keep on paying the parents part of their previous income during the first 14 months of the baby’s life. (This is great, but still ties the benefits to you participating in the job market prior to pregnancy — for me, who became pregnant after college and doing a lot of unpaid internships at age 24, this meant that I received only 300 euros a month –luckily the dad was able to support me). This might seem far away for a non-welfare state like the US, but here in Germany people are actually discussing a basic income for everyone that’s not tied to your participation in the job market (based on the assumption that we all have an inherent drive to create). Though a parents’ contribution and work 24/7 can barely be monetized, I do think such a basic income could help relieve the frustration around juggling baby/toddler sleep with earning money within our system. Leaving this here for anyone who needs it as validation and support. 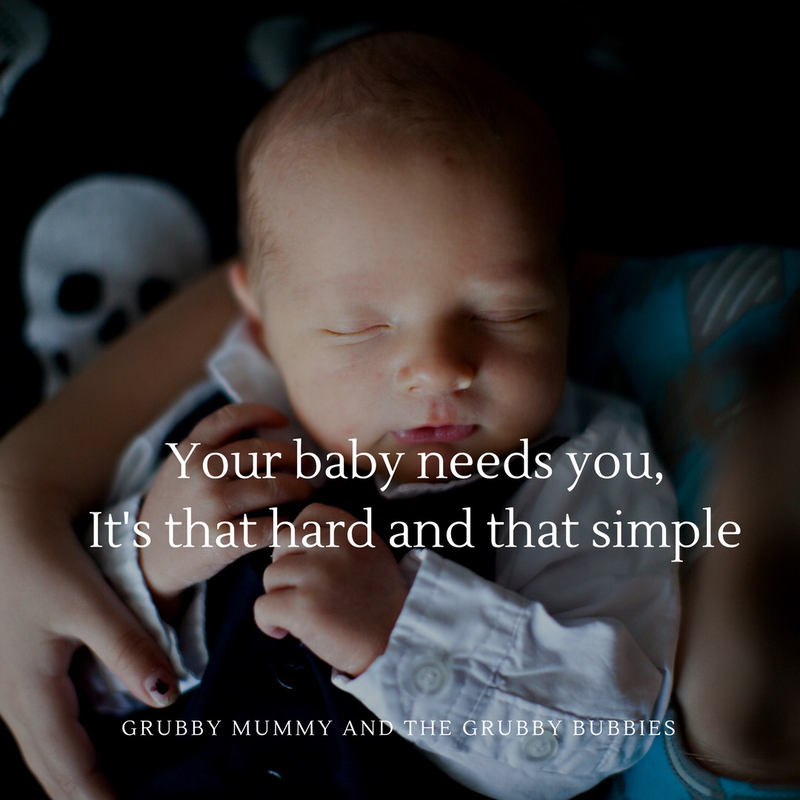 As a new mum last year, I felt a lot of pressure to stop answering my baby’s needs at night, as though I was doing something terribly wrong by doing so. I had no option but to stay true to me (which was incredibly hard and often very lonely): I’m his mother 24/7, not just between the hours of 7 a.m. and 7 p.m.
We need to change the current script around mums and baby sleep as an entire society. This article is a wonderful start. As a father, trained psychotherapist, and an adherent to the important principles of early childhood attachment, I think this is the most poignant and important article I have read recently. It would indeed be a different world if new parents understood the new paradigm rather than doing what their parents did to them. We are ready as a society to move beyond the CIO culture. Babies need their parents 24×7, not just when the sun happens to be up. Developing baby brains don’t need to be inundated with cortisol as they try to calm themselves because they are literally terrified not being with mom. It’s so unnatural that one would want to ignore their baby’s screams … and that impulse that’s telling you it’s not right is what moms should be listening to. Let’s move to something better.